Every Arizona driver license has an expiration date. You will not receive any notice from the Arizona Motor Vehicle Division ("MVD") that it will expire. If it is about to, you should have the driver license renewed if you intend to drive again. Even if you don't drive anymore, you should get an official Arizona ID card if your Arizona license has expired. There are many things you can do online at MVD, but renewing an Arizona driver license is not one of them. You can, however, complete the application for the renewal online and print off a single sheet with a barcode on it; that makes checking in at MVD faster. You can apply for license renewal if it will expire in six months or less. If you need a duplicate license because yours is lost or damaged, you can order that online, as long as the license has not expired. To renew your Arizona driver license, you must actually appear at an MVD or third party service provider office in person. You will need to take a new photo, pay a fee, and, in some cases, take a vision test. When you arrive at MVD, present the application that you completed online, or get the Driver License/Identification Card Application there and fill it out. You'll need that along with your current driver license and a second form of ID. A passport always works, but if you don't have a passport check the list of acceptable forms of identification for MVD. 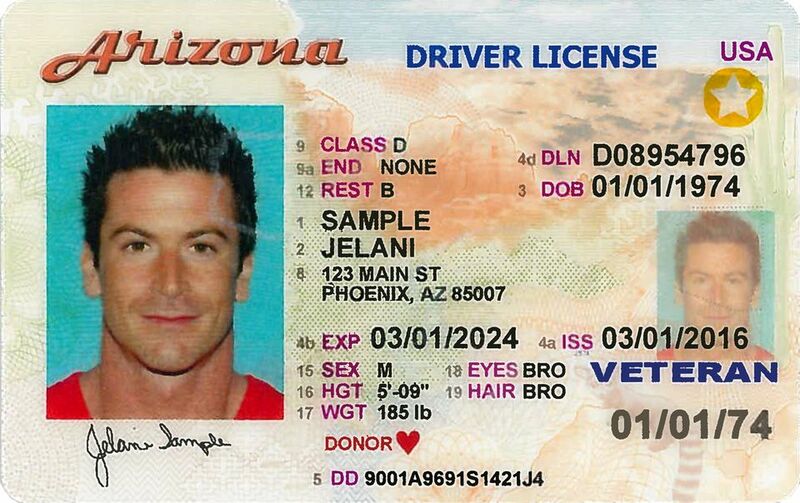 Arizona issues an "extended" driver license that does not expire until age 65. Still, the photo on the license and the vision exam must be updated every 12 years. Drivers 60 years old and older receive a five-year license. If you renew (or get a new) Arizona driver license, it will indicate, "Not for federal identification." Hey, what does that mean? Read on! After October 2020 the Arizona driver license that you have now will not be acceptable identification for travel monitored by the TSA (air travel, cruises, etc.). If you are renewing a driver license or getting a 12-year photo update, you might want to consider getting a Voluntary Travel ID. The Voluntary Travel ID is the credential that complies with the federal REAL ID Act for getting through security checkpoints at airports, restricted federal buildings, and military bases. It is available as both a driver license and an identification card. The Voluntary Travel ID is valid for up to eight years. There is a fee. A document establishing citizenship or legal presence such as a certified birth certificate, valid U.S. passport, or valid immigration documents. A Social Security card or a W-2 form to confirm Social Security information. Two forms of documentation to establish proof of residency such as a bank statement, utility bill or an Arizona Voter Registration Card. All residency documents must have a current address. A full list of acceptable documents is available online. Arizonans who travel by plane or need to pass through other federal security checkpoints may use an alternate form of ID such as a current U.S. passport or a military ID after October 2020, but not the driver license that was issued years ago. If you must renew your driver license anyway, why not get one that complies with federal REAL ID Act? There is no reason not to get one. That way you won't have to carry your passport for domestic travel.